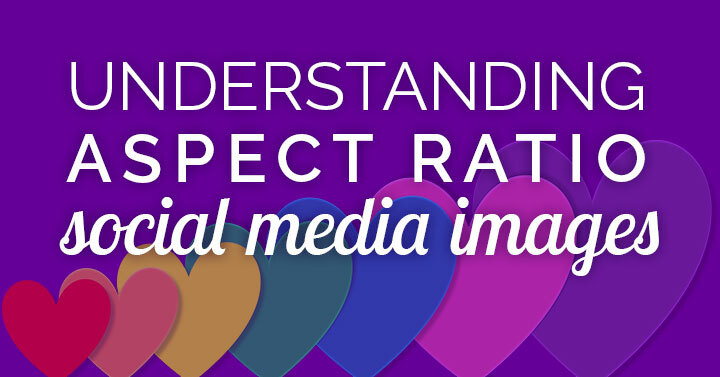 What the heck is social media image aspect ratio? More importantly, why should you care? Because understanding this concept will make your image creation so much easier! You will no longer have to stress over every pixel in your social media image sizes! And, you’ll be able to communicate clearly if your image size isn’t working. Because it’s not about the pixel size. It’s about the aspect ratio! I get it. Facebook cover photos are confusing. Yes, your image is cropped differently on desktop and mobile. That’s why I wrote a series of posts that have helped thousands of image creators. Problems that may arise aren’t about the pixel size, but the aspect ratio (or shape, or proportions). On each of these Facebook cover photos, the aspect ratio differs for desktop or mobile view. The easiest way to deal with the Facebook cover photo size dilemma is to start with a 16:9 aspect ratio horizontal image and be prepared for plenty of cropping at the top and bottom once uploaded to Facebook. As long as you keep text overlay or important features away from the top and bottom, you’ll be fine. 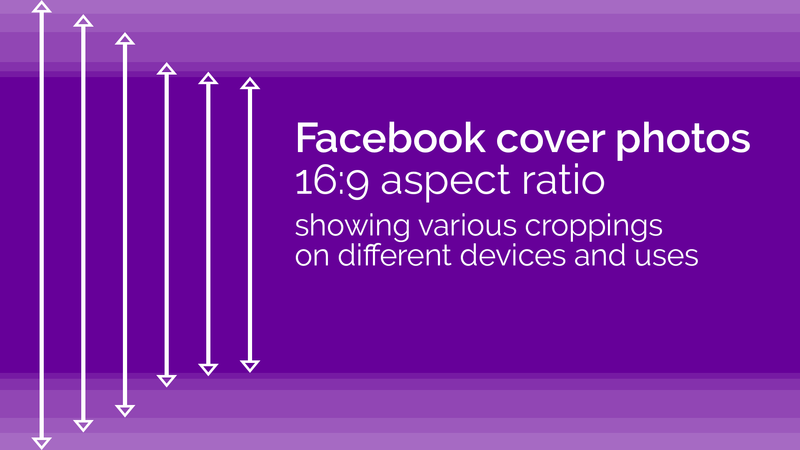 Facebook cover photos in 16:9 aspect ratio showing various croppings on different devices and uses. 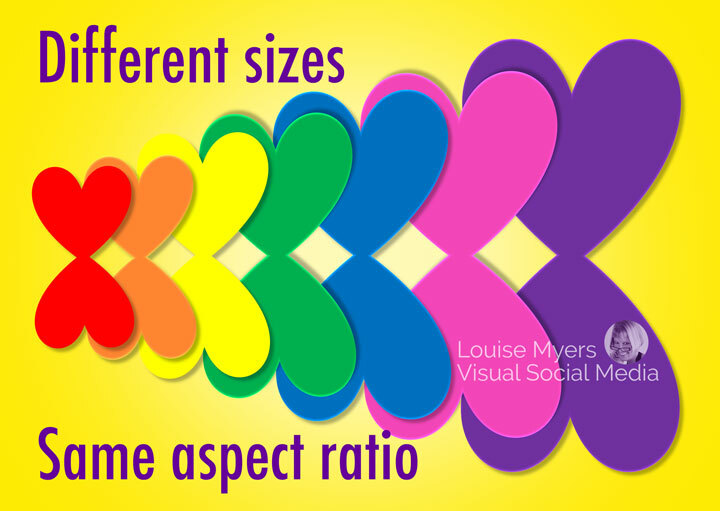 From most horizontal to most vertical, here are the aspect ratios and suggested sizes that work across social media. Some shapes work across several platforms: asterisked* means it’s the preferred shape on that platform. Pinterest no longer recommends these “tall pins” but they’re still successful! There isn’t a set aspect ratio for infographics, BUT I strongly recommend you stay in a 1:2 to 1:6 proportion. Much taller than that and your infographic becomes annoying to scroll, especially on mobile. Pinterest has often emphasized that the optimal shape is 2:3, or 1 1/2 times taller than wide. From square (1:1) to 2.1 times taller than wide. Pinterest no longer recommends anything other than 2:3, but myself and many others have found anything in this range of proportions to be effective. Recommended width: 600 pixels, up to the width of your blog content area. For high resolution, use 1,000 pixels wide and upload to Pinterest or Tailwind to avoid slowing down your site with large images. Multiply your width times 1, 1.5, or up to 2.1 to get a Pinterest-optimal image shape. Related read: Are You Using the Best Pinterest Pin Size for 2019? From 1.91:1 (horizontal) to 4:5 (portrait). All will be center-cropped to square in your gallery. When you create a video asset for Facebook or Instagram, design for mobile first. Vertical video (formats 4:5, 2:3, and 9:16) can be most engaging, since most people hold their phone upright. Facebook, Instagram and Audience Network support a range of aspect ratios from 16:9 to 9:16. The depictions below give a feeling for the different shapes. Note how much more impactful the taller shapes are! For video ads on Facebook without links, full portrait (9:16) is best. When using this format, ensure the most important parts of your video also display within the vertical (2:3) aspect ratio for optimal rendering in News Feed. For video carousel, use square (1:1) and consistent ratios for all videos in a carousel. For in-stream ads, use full landscape 16:9 to match video inventory. Instagram supports 1:91 – 4:5 for all feed videos across all objectives. Instagram Stories only accepts and displays in full portrait (9:16). Download the video aspect ratio guide (PDF). I hope the illustrations I’ve provided have helped you understand what aspect ratio means! My goal is to alleviate your confusion and simplify visual content creation. Scroll back up to find the links for the articles specific to Facebook cover photos, Pinterest Pins, and Instagram images. 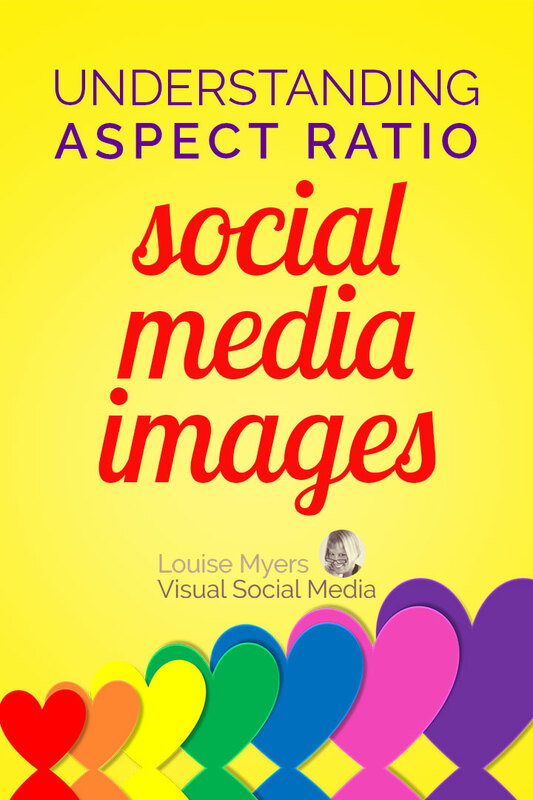 Please Pin, share, or tweet this post about social media image aspect ratio. Thanks! Louise Myers is a graphic design expert whose designs have been featured by Disney, Macy's, WalMart and more. Her straightforward writing style empowers small business owners to make their own graphics for social media success! Keep these eye-opening posts coming, I love ’em! Thank you for such well written and amazing visuals. I found you last week, lost your link and frantically looked everywhere yesterday. I then I found you (sigh of relief 😉 yay! You are now bookmarked and that doesn’t happen often. Keep up the great work! It is really appreciated and I love the updates on the articles. You rock! A very good article. It helps, but my main problem is that my digital artwork loses quality if it is big to start with. Social media sizes it down and that causes a loss in visual quality. It looks beautiful on a desktop at 1080 square. But on Instagram, Pinterest, and Twitter it loses fine lines that are crucial to displaying it. If I make it smaller than 1080 x 1080 – say 750 x 750, it looks better on social media, but that is breaking the Instgram rule. And I want to use Instagram, which I have little experience with. Will my artwork actually display at 1080×1080 anywhere on social media. Thank you. I could use any helpful advice. Use the size it looks best at (be sure you’re checking on multiple devices, not just one phone). Don’t use fine lines in your Instagram post art. Hello, it’s me again. I posted the question above. I thought of a solution that works. I created a sharpening filter in it that seems to work well on my digital artwork. So it was a matter of adding some sharpness. At least for my work. Thank you. I rushed over to add this solution so you didn’t have to reply. And perhaps it will be useful for other artists. It’s worth a try. There are many sharpening filters one can choose from online, I just happen to like Topaz products. Great article! Is there a good rule for avoiding anything being lost around the edges when video content is viewed on different phones? They all have slightly different screen width and height after all. How much space space should be left? Different phone screens do have different pixel sizes and aspect ratios. Whether that crops the video – I doubt it. I haven’t researched it though. Great information, I have had the biggest headache for the last few days trying to post 5 videos that are all under 15 seconds as a INSTAGRAM STORY VIDEO CAROUSEL ad. I tried to publish the AD put keep getting an error message about the aspect ratio HAS to be 1:1 ratio. As a matter of fact, here is the exact quote of the error message “Invalid image aspect ratio: The aspect ratio of the image HAS TO be 1:1.” I am not a graphic designer, and the person that I had to do the work for me is just as confused as I am. I need some help, please!I looked for an app that could easily convert the video to 1:1, but found nothing. I have been trying to get this INSTAGRAM STORY VIDEO CAROUSEL AD up since Monday and it’s officially Friday now. Do you have any suggestions on what I should try now? I can’t recommend anything specific as I haven’t run ads OR converted videos. But googling “convert video aspect ratio” shows a number of options. Are you sure Story ads are that size though? It makes no sense. Thank you for putting this together! I always struggle to explain this. This clearly explains it and that purple image with the arrows to illustrate FB cropping is the best thing since sliced bread. Definitely gonna share this link often. You’re welcome, I’m glad you liked it!